» Related content: Learn some lessons on dealing with fear from free solo climber Alex Honnold. After writing my article on goals and Everest, Christian Swann contacted me on Twitter to draw attention to a research paper he had been involved in. The research made an interview-based study of 14 experienced, elite climbers, exploring common themes around mental toughness. 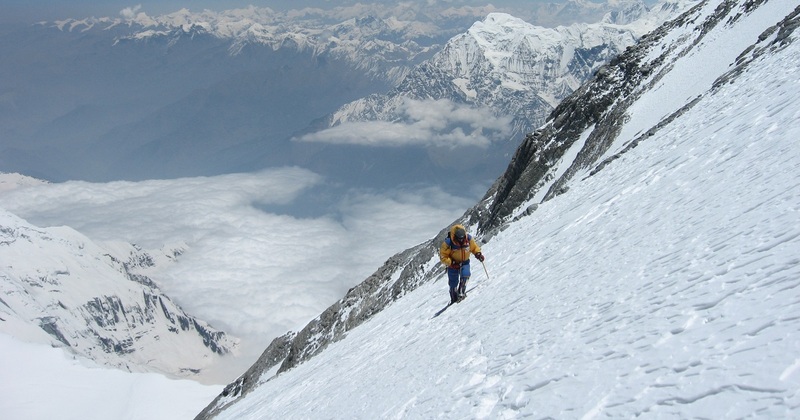 Within this group of climbers, two were experienced expedition leaders, and all had an average of 19 years climbing experience and just under 10 high-altitude expeditions. The themes from these interviews can have important implications for how we manage our goals within sport, and so I feel they’re worth sharing. The first lesson comes around the climbers’ interactions with risk. Climbing is obviously an inherently risky endeavor, with the risk of death quite high; fortunately, most of us deal with much lower risks in our sports—we’re probably not going to be killed in competition—but we still get exposed to regular risks, such as overtraining, injury, and poor performance. A common theme from the interviews was that climbers accepted that there was a substantial risk with their activity; for the most mentally tough, this represented a challenge to them. However, the climbers’ were adept at managing this risk; they accepted that things could go wrong, and had plans in place to both reduce this risk, and what to do if they did. As an example from my career, when I started doing bobsleigh, I was genuinely terrified of crashing. In part, this was because someone I knew had a bad crash a year before I started, having to be airlifted to hospital. Over time, I became more comfortable with this risk. In part, this was down to continued exposure to the chance of crashing (and not doing so), but also taking steps to reduce the chances of damage if a crash occurred; wearing the right protective clothing, strengthening my neck to absorb the forces, and mentally rehearsing what to do. I was fortunate to always have an experienced bobsleigh pilot, so the risk of crashing was further reduced, but when it eventually happened, all these steps I put in place helped prevent any issues whatsoever. Similarly, sprinting is an inherently risky activity from the perspective of hamstring injury, and so managing this risk through technical training and eccentric loading activities is a sensible way to mitigate this risk. Had good situational awareness; they were constantly looking for new pieces of information to inform their planning. This is the same for a coach: what information can you gain from your athletes in order to better support your decision-making processes? Made logical and rational decisions. Pushed hard, but sensed danger. I think this is a crucial aspect for an athlete; sometimes, it takes more mental toughness to pull out of a training session halfway through because you feel a small niggle, than it does to push on and “grind” it through. Making difficult decisions is a hallmark of mental toughness, and stopping when you could so easily carry on requires this difficult decision to be made by an athlete. Understand the limits, and demonstrate restraint; related to the last point, any idiot can work hard in training on a given day. What separates elite athletes from the rest is that they have a consistent training level; any single day is not “amazing”, but they come back time and time again, stringing together “good enough” sessions in order to improve. Reframe success and failure. As I moved out of the junior ranks into senior athletics, I started to win far fewer races. This is to be expected, and, in part, it’s because I tended to seek out races in which I would be challenged, as I thought it brought out the best in me – my best ever race is from when I was certain I was going to come last, and I used this fear to over-perform relative to my competitors. This process of going from success as a junior to getting regularly beat as a senior means that you have to re-frame your definition of success. It’s not always about winning, but by performing well. Of course, you should aim to win, and not winning should hurt, but a (at least partial) reframing can be very useful. Mental toughness is not always a positive. The climbers also identified some of the dangers associated with mental toughness, many of which carry over into sport. A common example is that mentally tough individuals persist for too long; they keep going, even when all the signs suggest they shouldn’t, even hiding issues from coaches and medical staff. As a coach, the key here is to guard against this; encourage openness in your athletes by being trustworthy, but also educating them as to the importance of consistency; no single session makes an athlete, but a single session can break them. In summary, the paper is a useful practical example of how elite performers can develop mental toughness. For athletes, I think the biggest lesson is that this mental toughness often means making a hard decision—which so often is to stop doing something—as opposed to carrying along the path to a pre-ordained goal. By being wary of this, hopefully we can all guard against goal-induced blindness.